Alakha Nath Temple: Bareilly, India - An account of a visit to the headquarters of the Anand Akhara order of Naga sannyasins. The Asylum of Sarabhanga - The virtual hermitage of Sarabhanga Giri, with pages on yoga, yatra, shiva, shakti, veda, vedanta, god, tantra, mantra and early indian history. Audrey E. Kitagawa - About her spiritual experiences and mission to propagate the message of Sri Ramakrishna. Basic Hindu Concepts - About the name, roots, scriptures and practices of Hindu religion. Bhagavat Dharma: R.K.Padasalgi - The cult of Bhakti(Devotion to God) propagated by the various haridasas of Karnataka with their brief biography. 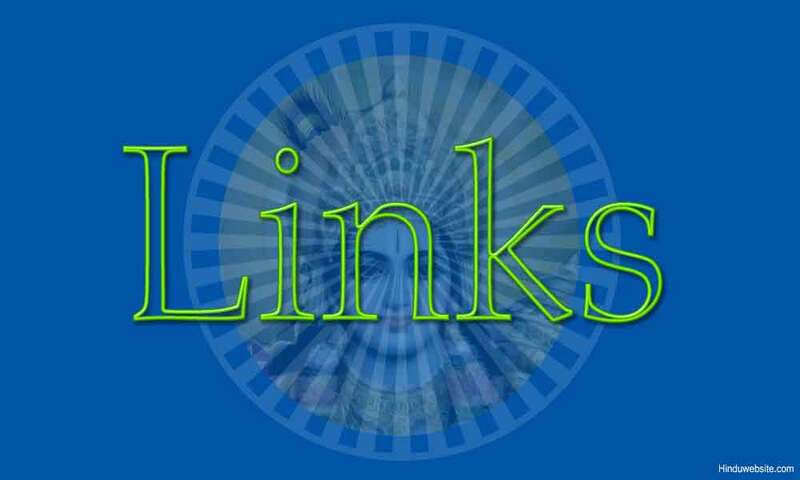 Bhakta Garry - About Krishna consciosness with slideshows and articles about ISKCON. Daily Prayers of Indian God - Sanskrit translations of Indian (Hindu) gods prayers. Dr. Mikhail Mikhailov: Belarusian Vedic Center - Vedic astronomy,script,kshemendra,kshemaraja books on Ethics,ramayana mythology and indology. Durgotsav at Kalpakkam - Durgapuja at Kalpakkam, Tamil Nadu, India spans over a few weeks. All are welcome during our next puja occasion. Girish Sharma - Sanskrit hymns to Lord Ganesha, Navagraha, and Mantrapushpam in pdf format. Goddess Gauri - An essay suggesting an etymological connection between the English word garish and the Hindu goddess Gauri. Gupta,Ram Eivind: A Shift in Dharma - Abstract of a study on second-generation Hindus in Oslo, Norway. Downloadable full text of thesis in PDF. Hinduism Scriptures - A brief essay by Octavian Sarbatoare. Hinduism: Teen view - A teen's view of Hinduism. History of Bharat and Bharatiya saints - History of the land called Bharat. Life and works of some of the great saints of this land, who shaped Hinduism and gave meaning to it. Holla Subramanya - A collection of Hindu Deities wall papers. Indian Philosophy and Religion - General information, essays on Hinduism, religious texts, an overview of traditional and modern schools. Inner Chamber - A place for quiet meditation and visualization, a lonely place out in the middle of nowhere, far from the maddening crowd. In solitude some of the secrets of inner life can be explored. Jayaram Srinivasan - Articles on OM, Hinduism, and Vedanta. Joe's Page - Spiritual experiences with Sathya Sai Baba, Ammachi and Ramana Maharshi. Jolly Swami - About the mission of Sridhar Swami in Hare Krishna movement. Krsna Consciousness - Gain pleasure unlimited by the practice of Bhakti Yoga. Krsna-nama's Webpage - The philosophy of Krishna Consciousness and the chanting of the Hare Krishna mahamantra. Lawrence C. Chin - A view point about the stucture of the Vedic (sacrificial) religion and its evolution toward the philosophy of the Upanishads. Legend of Muruga - The story of Sri Muruga and the legends of the Aru Padai Veedu temples. Madhurima's Page - A collection of articles on various aspects of Hinduism and Indian culture. Mark's Hinduism - About Hinduism, Sanatana Dharma, and Bhakti Yoga. Includes links to other sites about Hinduism. Mother Mary Mae Maier (1894-1970) - A biographical sketch of the devotee of Prabhu Jagadbandhu. Naval Vithalani - Life and photographs of Swami Sivananda, Swami Chinmayananda and link to download of Holy Geeta by Swami Chinmayananda. Nick Applebee - Experiences with painting as a form of Sadhana. Parasuraman - Information on vedas, gayatri mantra, mantra japa and karma sutra. Pictures of Deities and Saints - Contains pictures of Hindu deities and Indian saints. Rajesh Banka - A short introduction to the different Gods and Goddesses. Includes images. Sairam - Discourses, bhajans, mantras, and information on Sai Baba. Sanatana Dharma - About Hinduism and answers to questions from visitors pertaining to religious, spiritual, philosophical, and cultural dimensions of Hinduism. Satkaival Saheb - History, photo album, masik, and bajans. Shankar Gallery - Art for the soul by S. S. Shankar, including lingams, advaitas, mandalas, sumie doors, yatras, yantras, mahasamadhis, kalas and nadas. Shree - Articles on Dharma and Sankhya. Srinivas - Resume and articles on Hinduism, vedas, upanishads, Ramayana and Mahabaratha. Srinivas - Articles about Hindu philosophy and extracts form Swami Vivekananda's speeches. Suba's Campus - Articles on Saivism, Upanishads and information on temples in Europe. Some of the pages are in Tamil. Subbu - Offers an on line version of the book "Autobiography of a Yogi". Subhash C. Sharma - An article exploring some of the social and historical issues based on the Ramayana. Subhash Sharma - Articles on the caste system, cremation and its origin, and Karva Chauth festival. Sushil Kumar Srivastav - Two articles on Hinduism. Other articles in Hindi. Third eye - About the yogic experiences of the author. Udakashanti - Download of text for Udakashanti with pronunciation markings, available in both Sanskrit and Kannada fonts. Under Eternity Blue - Postings about Sri Chaitanya Saraswat Math, including collected news, personal anecdotes, and photographs. Vaishnava screensaver - Free download of "Vaishnava Visions" screensaver of Lord Krishna and Srila Prabhupada with musical background. Welcome to Jen's Home - Journey with an American to India and learning about Hinduism and life. Babaji, the Immortal Yogi - Page of dedication to Babaji. Fyodor Safonov - Author of the book " The Modern Yoga " in Russian. Ian Robertson - About ashtanga vinyasa yoga. Includes personal information, teachers, photo gallery, and yoga links. Kundalini and Christianity - The possible connection between Kundalini and Christian spirituality from a personal experience. Michael Smith - A personal blog about experiences with Yoga. Pulaha - A follower of Gurumayi writes of his devotion, memories of the ashram. Sound clips of chanting and tabla music. Vincent J. Daczynski - Offers online book about his travel to India and Yoga guru Sri Tat Wale Baba. Yoga and Harmony - Articles on Yoga psychology, Kundalini Yoga, and Upanishads. The author who belongs to the Natha school, has written from personal experiences over the last 35 years. Yoga, Posture and the Alexander Technique - The process Mary Albro went through to find a suitable guidebook.